The Communion of Apostolic Churches is a global communion of apostles, prophets, evangelists, pastors and teachers, together with the ministries and churches they represent. It is a worldwide network of networks or ministry spheres, a communion of diverse apostolic jurisdictions of ministers and churches joined together in the Lord Jesus through mutual recognition and voluntary submission for consultation, cooperation, and accountability of the apostles and elders (the ruling pastors or bishops) who are the spiritual heads or fathers of these governmental spheres. The term apostolic is used by the CAC simply as an adjective to refer to everything that pertains to Jesus the Christ, the Chief Apostle, the Apostles of the Lamb, and the first ascension-gift apostles of the Lord Jesus which has been providentially preserved for God's people in the Canon of the New Testament. While Church councils and creeds have at times been helpful in dealing with various issues and adversaries throughout Church history, councils have also erred; therefore we understand the Canon of both the Old and New Testament Scriptures to be the only true measure of faith and practice for the Church of Jesus Christ. We further believe that the message of the Old Testament patriarchs and prophets has been unveiled or fulfilled in Jesus Christ, His Kingdom, and His Church, and that the Canon of the New Testament contains the full revelation of these divine mysteries that were entrusted by the Lord Jesus to His original apostles. 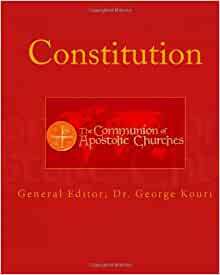 Thus the CAC is committed to the recovery and restoration of the faith and practice of those first apostles who laid the foundations in the first century for true Apostolic Christianity and for the Apostolic Church.